We’re used to having other people’s names stitched into our underwear and going to punk rock concerts sponsored by banks, but how do you build a blog brand? Sure, Gucci can get away with bedazzling its logo on dog collars, and no one would bat an eye if Louis Vuitton came out with a line of luxury baked goods, but publicizing a personal blog without overt awkwardness or coming across as, heaven forbid, (just typing the word hurts) narcissistic, is almost impossible. It helps to get creative. Some of my, if not classy then at least less dignity destroying, strategies have included blog advertising shoes and a promotional bookmark flip book. These two DIY methods tend to catch people off guard, which, not coincidentally, is key to both advertising and horror movies. But for someone whose fear of networking can best be described as pure liquid terror, I am completely in the dark (possibly hiding under a table somewhere) about the social etiquette of self-promotion, especially when it comes to blogs. I can’t believe I’m telling you this, but I’ve actually handed out said bookmarks at funerals (oh for shame!) and even in airport public washrooms. I know, I know, totally inappropriate. All I can say is that like so many stupid-in-hindsight impulses, it always seemed like such a good idea at the time. I have to confess that last night I hit a whole new low on the appropriateness scale. I was riding Calgary’s C-Train when another one of those “good ideas” popped into my head. The temperature had also hit a new low last night, and the two glass panels of the door I was standing beside were covered with a thick layer of frost. Someone had scrapped a jagged window with finger marks that looked like they’d been trying to claw their way out. Which, being a public transit regular, I can totally understand. I drew a small happy face in the top corner of the closest panel with a gloved finger. But that wasn’t enough. My gateway doodle led to a panel wide artistic portrait of a woman’s face, quite impressively executed, considering the medium – if I do say so myself. I spent the next few stops appreciating the poetic irony of being bundled beyond recognition while looking at a reflection that was the mirror image of my summer self. But, of course, that wasn’t enough. Here was a rare opportunity for a DIY blog billboard! I scratched BLANKCANVASLIVING.COM into the second panel in an inverted U shape, leaving the space in the middle open – because every advertisement needs a visual. And what better blog brand ambassador than our darling mascot (see side panel) Mitch-the-insatiable-itch! Here’s where things went horribly wrong. By this point my finger was blunted with snow and I had to rush because we were almost at my stop. Finishing my ‘artistry’, I hurried out the opposite door – already beeping with urgency – and took a quick look back to survey my handiwork. Oh Gawd! I’d just drawn – with wiggly distorted lines – what could best be described as a horned stick figure with a set of disproportionately huge male genitalia dangling under its belly!!! I had to watch it leering at me from under my calling card as it set off down the tracks – in full view of all the passengers! Nothing like lewd graffiti on public transit to really take your blog brand to the next level… sigh. It was one of those mornings… a five snooze alarm, sleep vs shower trade-off morning, when you dream you’ve woken up and left for work then wake up and have to do it all over again. It was one of those mornings when your bed is your entire world and any universe beyond is dark, cold, alien, and empty, and the warm comfort of your sheets weights your body with the gravity of a thousand suns. You know, one of those mornings. I waited until the last possible second before getting up, savouring each ‘tick’ with the knowledge that these were the last precious moments of self before the blind suffering of routine would rip me out of my bliss and cast me, shivering and whimpering, out into the unholy frozen city. Ok, so maybe I’m getting a bit carried away, and of course I’m grateful for all my blessings and, quite frankly, even to have a job to wake up for. But our humanity is pretty raw at 6:30 in the morning, and the gloss of rational thinking is rarely available before lunch (if at all). Trudging along the bikepath, I was still locked in hostility – towards the weather, towards all the bikers who ‘dinged’ at me, towards the little patches of ice that seemed just as hostile towards me, and, unforgivably, towards a woman I love who is suffering so much more than myself. I’ve been trying so hard to find solutions to her problems, to guide her towards relief, but she keeps slipping deeper. No, I told myself, right there on the path. I’ve do so much, all I can. I just need this one moment to be my own. No job, no worries, no obsessing. Let me ‘just be’ in the story of this landscape. I focused all my energy into my senses: the sharp cold smell of the Bow river, the crunch of the snow under my sneakers… I lifted my eyes up from the pavement and gasped in unabashed awe. Calgary’s downtown skyline was on fire with a rapturous sunrise, all glowing hot pinks and soft peaches, fading high overhead into a delicate lavender border. Absolutely gorgeous, and huge! We’re ‘big sky’ country here in Alberta and this morning the colours reached far beyond their usual semi-circular modesty. This was an entirely new atmosphere, an entirely new backdrop to the city. And then it hit me. I was walking to work on Mars! I angled the brim of my baseball cap to block out any earthly, pedestrian blue. My world was Mars and I played the story through in my mind. Only a thin yellow line separated me from the joggers and bikers on my home planet, journeying into an opposite sky. I was alone in this magical new vision. I changed the snow to dust and the buildings to alien constructions. It wasn’t hard. 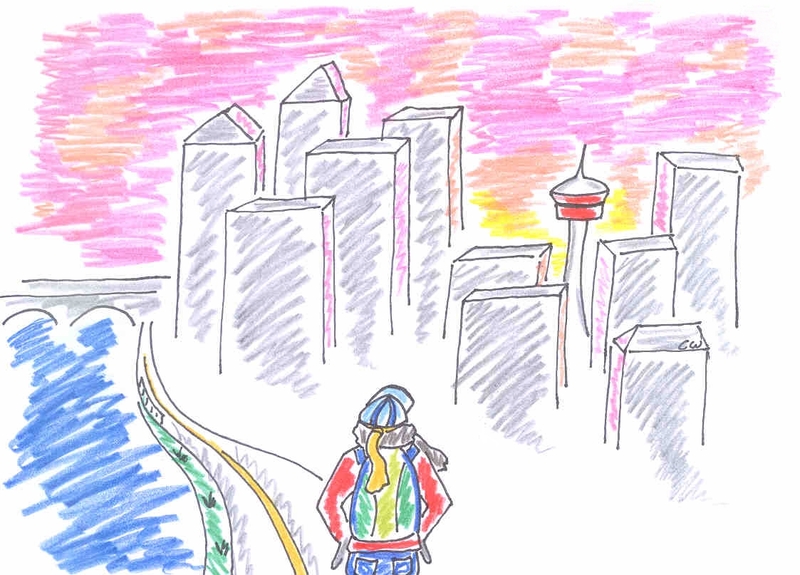 In the last quarter century Calgary has transformed into a hulking, though glittering, vision of past futures. But I felt a sudden gut pang of sadness. This Mars was so beautiful, yet all would be lost to time. Whatever its past may have held, our shared Mars has been blown back to red dust. But I would always have my Mars, even when the sky came back to Earth, and even when later I’d check Wikipedia and find out the dull truth about the real Martian sky. But in that glowing pink moment of my own, I thought of the woman I love, and a new idea. Overwhelmed by the crushing enormity of making a change, she holds the first small step in her hand, but tells me she always puts it down because she thinks “it doesn’t matter.” As I stood delighting in my Mars, I realized I had crossed epic time and space by giving myself the simple permission to enjoy the moment as purely, unapologetically ‘me’ – because “I matter.” If I’ve brought back anything from my Mars, it isn’t a sample of gas or rock, it’s the gift of knowing that even when you feel like “it doesn’t matter,” you still do.